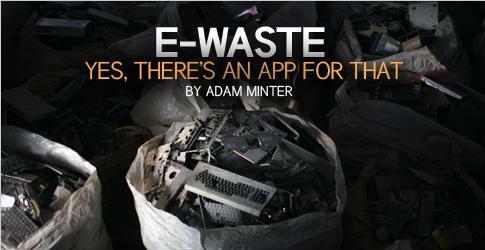 E-waste – There’s an app for that. My first piece for Foreign Policy, “E-waste – there’s an app for that” is now live. It covers a couple of different issues, including the growing tide of Chinese generated e-waste, and the rather limp response to the problem by Apple and other consumer electronics companies (especially as compared to the efforts they make in their home markets). Regular readers of this blog know that I’ve been thinking and writing about this issue for a long time. However, I really have to thank the visionary Mihela Hladin of Greennovate in Shanghai for getting me to think about the responsibilities/irresponsibilities of consumer electronics companies in China. She’s been on the case for a long time, and Greennovate’s terrific new MaGiC initiative [Made Green in China] is the proof. As the website notes, it is nothing less than “Greennovate’s initiative to challenge the traditional mindsets locked into the label, ‘Made in China’.” I’ll have more to say about it soon.